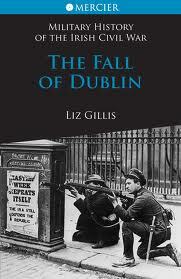 Liz Gillis’s new book, the latest in Mercier’s, ‘Military History of the Irish Civil War’ series, deals with the fighting in Dublin between June 28 and July 5, 1922 between Pro and Anti-Treaty forces which marked the start of the civil war. The battle was a scrappy affair, beginning with the long-anticipated Provisional government attack on the anti-Treaty garrison in the Four Courts and ending with the piecemeal reduction of the other republican positions in the city. Gillis argues that not only the battle but the war itself was decided when the first shells from National Army guns, lent to them by the British, hit the walls of the Four Courts. The anti-Treaty side’s leadership was divided – Liam Lynch, who commanded their forces during the civil war had actually disowned the occupiers of the Four Courts – their military planning was non-existent and their fighters were willing but poorly prepared for combat. These are fair points but Gillis does tend to play down the military weakness of the Free State at the outset. That their forces in Dublin would be well-led and well coordinated enough rapidly to disperse the anti-Treaty forces was not a foregone conclusion and more might have been made of the achievement here of commanders such as Paddy Daly and Tom Ennis. This book, however, is not really a military analysis, but essentially a straightforward account of the battle that secured the capital for the Free State. The reader is quite vividly taken through the siege of the Four Courts – a far less one-sided matter than it is commonly presented as – and the combat around the city centre, notably at O’Connell Street but also at such places as the Swan Hotel on Aungier Street and on Harcourt Street. The experience of the combatants is well evoked; the Free State soldiers roaring up to houses in armoured vehicles, breaking down the doors and then storming the building, the republicans blazing away from their occupied positions against a storm of fire from artillery and armoured cars. The casualties that Gillis reports of the seven days of fighting, 61 killed and 270 wounded, were not huge, but what is striking is the amount of military force used. By Irish standards it was staggering – over 1,000 artillery rounds were fired at the Four Courts alone, and thousands of rounds of small arms fire, rifle grenades and dozens of Republican ‘mines’ were loosed on the streets of Dublin. The only bloodier affair in contemporary Irish history was the Easter Rising of six years before. Books on the Irish Civil War are often marred by partisanship. Even now, family loyalty and ideology make accounts of the conflict prone to bitter invective. Gillis is, however, well balanced and dispassionate. Of the most controversial episode in the battle, the destruction of the Four Courts’ public record office, she concludes that while blame must be shared by both sides (the republicans had mined the complex while the National Army used incendiary munitions) it is impossible to say who was directly responsible and the explosion may well have been an accident. This book is not the final word on the civil war in Dublin but it is a useful addition. This book is not the final word on the Civil War in Dublin, or even on the battle of June-July 1922. More remains to be said about the motivations of both sides, including the particular politics of Dublincity and the reaction of the various strands of the civilian population. In addition, it is not strictly speaking a military history and other works could go into the dynamics of converting guerrilla bands into militia armies and the ins and outs of urban warfare. However it is slim, easy to read and contains a striking collection of photographs and a useful appendix listing every man who participated in the occupation of the Four Courts. It is a useful addition to the belatedly growing scholarship on the Irish civil war. Our archive on the Civil War is Here. John Dorney’s The Story of the Irish Civil War is available here and reviewed here. Written by: John_Dorney on 28 July, 2011.on 18 November, 2013.